1. Prior to the second millennium BC, humans were not conscious (by and large). 2. The right hemisphere of the brain was dominant and directed humans via auditory and visual hallucinations that became the “gods” (and God) that appear in ancient literature. 3. 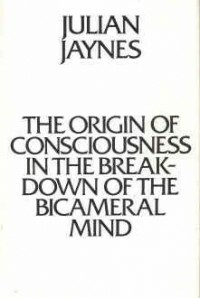 This condition Jaynes calls the Bicameral Mind (BM) (vs. the Conscious Mind (CM)). 5. The final nails in the BM’s coffin were the invention of writing and the increasing complexity of urban civilization, which proved too much for the BM to cope with. 6. Consequently, the CM is a product of acculturation, not an emergent property of the brain. 7. The first stirrings of the CM came in the 2nd millennium BC; and by the 1st millennium, it had become the dominant hemisphere of the brain. 8. The BM remains with us but in modern society is found only with schizophrenics and under special conditions (such as hypnosis, deep meditation or religious frenzy). In the early ‘70s, when Jaynes wrote, such an assertion found little empirical support but in light of modern research in language, evolution, archaeology and brain studies, it doesn’t seem as far fetched. I don’t believe in Jaynes’ stark demarcation between the BM and CM but having read works like Before the Dawn Recovering the Lost History of Our Ancestors, Inside the Neolithic Mind Consciousness Cosmos and the Realm of the Gods, The Singing Neanderthals The Origins of Music Language Mind and Body and (soon) The 10 000 Year Explosion How Civilization Accelerated Human Evolution, it’s clear that human evolution is ongoing and can be found in surprisingly recent events. That pre-language humans processed thought differently seems unassailable. Equally certain is that evolution works with the material at hand – it could easily be the case that the BM (or some neurological process that was not consciousness) remained dominant for a long time because the human environment didn’t select for consciousness until we began living markedly different lifestyles from our origins. On the other hand, consciousness of a sort may have been the edge modern humans needed to crowd out their hominid competitors – most famously the Neanderthal – which would push Jaynes’ CM back a few millennia. If there is a solution to the question, it remains elusive pending further evidence for how the brain works. Like Caesar’s Gaul, The Origin is divided into three parts. Part I is a bit of a slog as the author goes over current (as of the mid-1970s) research on brain functions and the nature of consciousness. It moves along well enough but can be tough going for those unfamiliar with the subject, despite Jaynes’ generally lucid and reader-friendly prose. In Chapter 2, Jaynes sets out the features of the CM: (1) Spatialization (objects of conscious thought are placed in a “mind-space”); (2) excerption (we think of particulars, not wholes); (3) the analog “I”; (4) the metaphor “me”; (5) narratization (the CM arranges facts into a story); and (6) conciliation (bringing narratives together into compatible schemata). As he writes: “Subjective conscious mind is an analog of what is called the real world. It is built up with a vocabulary or lexical field whose terms are all metaphors or analogs of behavior in the physical world. Its reality is of the same order as mathematics” (p. 55). Jaynes briefly looks at The Iliad, which will be dissected in more detail in Part II, in Chapter 3. He considers it the first piece of writing that we have full confidence in translating, and which is a clear example of the transition from the BM to the CM. Chapter 4 explains how the BM’s hallucinations worked. Essentially they were produced whenever a decision-point was reached, a novel experience that couldn’t be handled unconsciously. The mind obeys the voices because there’s no conscious distance between audition and volition (a similar phenomenon is found in hypnosis subjects and schizophrenics). In Chapter 5, Jaynes presents his evidence for why humans functioning solely with BMs could function and conceive complex civilizations. As well, he argues that the right-hemisphere functions of the brain (guiding and planning, organizing experiences) mirror the traditional functions of antiquity’s gods, while the left hemisphere mirrors the functions of mere mortals (analysis and verbal tasks). 1. Sometime between 70,000 BC to 40,000 BC, vocal qualifiers are invented (his example: “wa+hee” = “look out, tiger!”; “wa+hoo” = “look out, leopard!”). 2. Between 40K and 25K BC, imperatives and further qualifiers were elaborated. 3. Between 25K and 15K BC, nouns were invented (bases this on the appearance of cave art). 4. 10K-8K BC, individual names develop (though he makes the point that often these incorporate divine names and don’t appear to signify a conscious awareness of individuality). Part II is my favorite part of the book – a tour de force of icon bashing that leaves you breathless. In brief, Jaynes believes that BM’ed humans coped quite well for millennia, though in more and more complex relationships, ultimately creating the elaborate city-states and early nations made possible by the Agricultural Revolution. Eventually, Sumer invented writing, which weakened the authority of the BM by making the gods’ commands silent and locatable. They no longer carried volitional power. The BM wasn’t immediately displaced. It wasn’t until the 2nd millennium BC that conditions were right for the fully conscious mind to emerge (and, even then, it would be another 1,000 years for it to become dominant). I’m going to pass over Chapter 1 in this section as it’s primarily an introduction. Jaynes begins laying out his arguments in Chapter 2, where he explains his belief that all pre-CM civilizations were organized as hierarchical, absolute theocracies ruled either by steward-kings (Sumer) or god-kings (Egypt). People either interacted with representations of the gods (idols) or with their living avatars. Priest castes arose to regulate this heavenly diplomacy. In Egypt, the pharaohs as god-kings lost control of the system, which crashed c. 2000 BC with the end of the Old Kingdom. Subsequent periods of political unity exhibit greater and greater consciousness. The BM’ed steward-kings of the Middle East exhibited greater flexibility and coped into the 18th century BC before utter social collapse. Chapter 3 discusses the social chaos which ushered in the second millennium and the CM. Based on surviving inscriptions Jaynes believes that there were no private ambitions or grudges because there was no “private space.” Intercultural relations were carried on my men listening to the voices in their heads or form their idols. In times of plenty, relations were usually amicable; in times of want or stress, they deteriorated rapidly. The 2nd millennium BC was a period of high stress. Externally, populations were on the move, and nations such as Assyria and Babylon were expanding; internally, writing continued to weaken the BM’s hold on humanity, and men were losing the guidance of the gods’ voices. Jaynes characterizes the period as one of anomie and intense fear as humans found themselves “alone” as they had never experienced the sensation before. The response was a breakdown in authority and a calamitous rise in violence. Religions began to appear that were more than simply ritual but codified moral behavior and set down laws as well. It’s interesting to note the Jaynes’ timeline broadly reflects that of the Axial Age – the name historians have given to that period when the spiritual foundations of all modern civilizations were laid (see, Karen Armstrong’s The Great Transformation The Beginning of Our Religious Traditions or Rodney Stark’s Discovering God The Origins of the Great Religions and the Evolution of Belief or, if you prefer it fictionalized, Gore Vidal’s Creation A Novel. 1. Observation of difference: Humans saw something “else” controlling strangers’ actions and inferred a similar “self” within themselves. 3. The invention of lying: Not the movie but the idea’s the same. Humans became capable of projecting an outer persona that differed from their internal one. 4. Natural selection: Though Jaynes’ doesn’t believe the CM has a biological origin, he allows that it was a survival trait and that humans more capable of consciousness bred longer and faster than their BM cousins. Chapter 4 continues to build on 3’s evidence (or “evidence” if you’re not buying Jaynes’ brand of snake oil). With the emergence of the CM, humans no longer have a direct connection to divinity. Because the gods have fallen silent for most, we see the emergence of angels and demons, ideas of “good” and “evil” and divinatory practices (where the increasingly rare human conduit still heard divine voices (e.g., Delphi) or rituals sussed out divine pleasure (e.g., casting lots). In the Abrahamic religions, the Fall of Adam reflected this falling away from the gods: Man becomes separated from God, who used to walk with him in the cool of the evening in Eden. 1. Contrasts Amos (8th century BC) with Ecclesiastes (2nd century BC) and argues that the former is clearly a BM. Amos speaks only as the voice of God, without introspection. Ecclesiastes, on the other hand, is full of introspection and rarely speaks in God’s voice or even as His agent. 2. Development of the nabiim (prophets). Jaynes believes that the proto-Hebrews (the khabiru) were the remnants of still-BM-dominated outcasts pushed to the edges of CM’ed civilizations. From these dregs emerged men like Amos who still heard gods’ (or God’s) voices and spoke for them (or Him). Prophets became necessary because God was too remote. No longer heard, He was only seen, and then rarely in human form (such as a burning bush or a column of fire). They were required to bring some order to the inconsistent “voices.” The BM’s genius for enforcing social control and stable hierarchies was forever gone and God’s voice was saying different things to different people. Acceptable voices became orthodoxy; unacceptable ones became the ravings of the insane (a novel category as, in a BM’ed world, everyone was mad from a CM point of view). 3. Saul is the first fully conscious man in Hebrew history: He can’t hear God, he rebels against Samuel’s admonitions, and he lies. I scant Part III because my fingers grow weary. It traces vestiges of the BM still found in the modern world. It will come as no surprise that schizophrenia is the clearest remnant but there are also oracles, possession (including glossolalia), poetry and music (see Singing for some recent speculations along these lines), and hypnosis. As I’ve intimated, I’m not convinced Jaynes has stumbled upon the truth. His range of evidence is too narrow, too open to interpretation and largely unverifiable. But I also know that some remarkable evidence has emerged (see my recommendations above, among other works) that point to recent evolutionary changes in the human brain and it’s not inconceivable that our mentation could be markedly different even from that of ancestors within written memory. There is, too, the fact that we are only at the beginning of understanding the brain. Evolutionarily speaking, the CM is a newborn child of the mind, and how it interacts with its unconscious forebears is problematic. In that spirit, I recommend reading this book.